Google puts a lot of effort into making the world’s knowledge organized and accessible, and in particular it has a record through its Crisis Response project of making certain information more accessible during times of disaster. Today it released a blog post detailing how it’s doing more to help people be prepared. 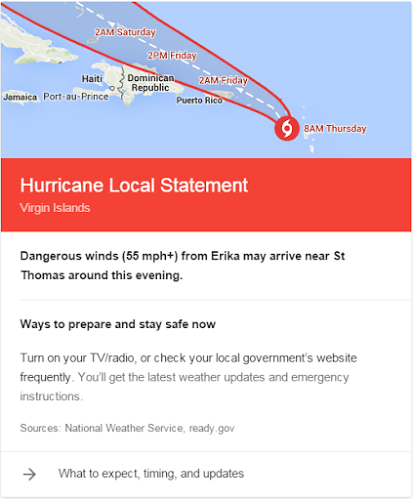 As that last bullet-point says, Google will keep its information regarding any particular storm, like preparedness recommendations, up-to-date and relevant based on context — where the storm is relative to your location and its intensity. If the storm is days away from touching ground, Google might tell you to begin preparing an emergency kit. Hours away and Google may tell you how to avoid injury from fast-moving objects and debris.